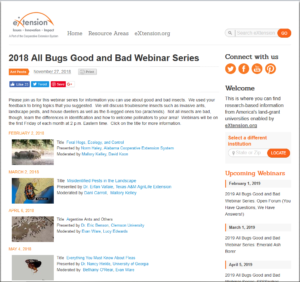 2018 All Bugs Good and Bad series – webinars in the 2018 series include “Attracting Pollinators” and “Misidentified Landscape Pests” – find these and others in the webinar series. 2018 Urban and Community Forestry Extension webinar series – visit the Southern Regional Extension Forestry website to watch “Trees for Bees” and other great webinars! Thanks to Charlotte Glen for compiling this list of webinars.